Direct link to Newtec's S2 Extensions infopage. [SatNews] Newtec has been awarded the accolade of ‘Outstanding Achievement’ at the ASBU BroadcastPRO Awards for the company’s pivotal role developing new S2 Extensions technologies. The winners were announced on Tuesday 12 November at the ASBU Broadcast Pro Summit gala dinner in Dubai. Newtec’s positive leadership in ensuring the on-going health of the satellite communications sector impressed the judges despite it being a closely contested category. Newtec was recognized for setting a new benchmark for success through its DVB-S2 technology upgrades, which boosts the satellite link efficiency up to 20 percent in Direct-To-Home (DTH) networks and 37 percent in other professional applications compared to DVB-S2—even up to 64 percent with wideband. The Newtec S2 Extensions include smaller Roll-Offs, advanced filter technologies, higher efficient MODCODs, more MODCODs fine-tuned for linear and non-linear operation, higher modulation (64APSK) and wideband (72Mbaud). These extensions have been contributed to the new evolution of the DVB-S2 standard. 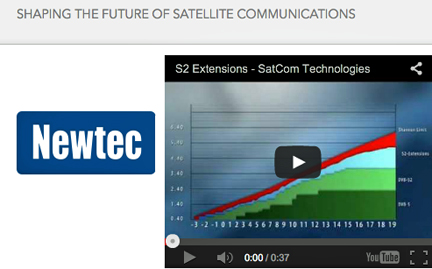 Newtec’s S2 Extension technologies have already been implemented on Newtec’s modulators, modems and hubs. On top of these extensions, Newtec has developed and added technologies such as Adaptive Coding and Modulation (ACM), bandwidth cancellation, pre-distortion, network and cross-layer optimization, all of which further increase transmission efficiency. These gains allow more people to connect all over the world giving them better access to education, to entertainment, to (welfare) services and to economic, political and social involvement.